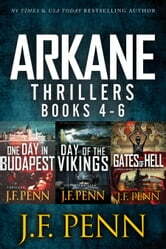 3 more fast-paced thrillers packed with ancient artifacts, relics of power and adventure at the edge of the supernatural. 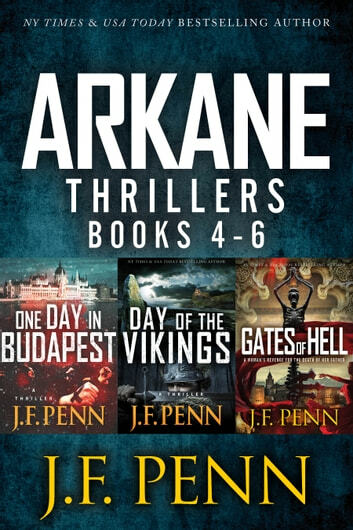 Ex-Israeli military psychologist, specialist in religious cults at Oxford University, Krav Maga expert … and now recruited to work for ARKANE, a secret British government agency investigating supernatural mysteries around the world. A ritual murder on a remote island under the shifting skies of the aurora borealis. A staff of power that can summon Ragnarok, the Viking apocalypse. When Neo-Viking terrorists invade the British Museum in London to reclaim the staff of Skara Brae, ARKANE agent Dr. Morgan Sierra is trapped in the building along with hostages under mortal threat. As the slaughter begins, Morgan works alongside psychic Blake Daniel to discern the past of the staff, dating back to islands invaded by the Vikings generations ago. Can Morgan and Blake uncover the truth before Ragnarok is unleashed, consuming all in its wake? Day of the Vikings is a fast-paced, action adventure thriller set in the British Museum, the British Library and the islands of Orkney, Lindisfarne and Iona. Set in the present day, it resonates with the history and myth of the Vikings. An ancient manuscript that leads to the Gates of Hell. A woman’s revenge for the death of her father. When the last of the Remnant is murdered at the Sagrada Familia in Barcelona, ARKANE agent Dr Morgan Sierra is drawn into the hunt for a supernatural Key. She's joined by agent Jake Timber, who must face his own fears as they decipher clues left behind by Kabbalist scholars. From ancient sites in Spain, to Israel and the Czech Republic, Morgan and Jake must follow the trail to the Key, while evading Adam Kadmon, a man consumed with a lust for dark power. As the planets align, Morgan and Jake race against time to find the Key and destroy it before the Devourers and the Polluted of God emerge from the Gates of Hell to ravage the earth. If you love action-packed supernatural thrillers, download a sample or buy now. I love it when books come in sets...the next one is already for you to read. Morgan is at her best diving into history to help save the future. A few new characters are introduced and by the end Jake is back. The fast paced tales kept me turning pages. I'm looking forward to more (hopefully longer) adventures. A rip roarig ride through archeology, religion and some seriously fascinting settings. Morgan Sierra is an awesome warrior academic. Short reads that jeep you guessing and wanting more. J.F. Penn has done it again! Once again I was entranced and could not stop once I started... I simply had to know what will happen! One Day In Budapest - Not only was this a bite sized but super fun story, it took me to a place I had no interest in before, and left me wanting to find out more. Fast paced adventure, with all too possible situations. Great read! Day of the Vikings - Being a HEMA enthusiast, I was very impressed by the correctness of the facts and the depths of the research. Exciting story with some unexpected twists! Gates of Hell - Once again, taken to a place I know nothing about, and leaving me so intrigued and interested! When Morgan received a package from her late father, she never expected it to bring her to the Gates of Hell!!! Thank you, J.F. Penn for these wonderful adventures! You have gained a lifelong reader and fan!